It’s easier than ever to access your financial accounts thanks to technology like online banking and investing platforms. However, it can be tough to discern how this technology can help you manage your financial life and achieve your goals. August’s Wealth Management Insights explores some of the key features of online platforms and how you can make use of them. Many online tools include extra layers of security for enhanced safety. Many online platforms offer a secure document exchange – a protected environment where you can share sensitive documents with a financial advisor. Some platforms allow you to send encrypted email messages to a financial advisor. With your permission, your advisor can also use this secure technology to share information with third-party professionals like an accountant or attorney. E-signature technology allows you to electronically sign key account documents from your personal device – no mail needed. This secure, encrypted technology saves time and often speeds up requests. You can use an online platform to control the amount and type of communication you receive. Online platforms often include a one-stop communication preference portal, which enables you to control traditional mail and email delivery. You can even “go green” by opting out of paper copies if you wish. Many platforms offer an alert feature to inform you of price and volume changes. This is an easy way to stay informed about securities you follow. In addition to your online platform’s tools and technology, check out your bank’s or firm’s social media channels. You’ll often find important news, market insights and even how-to videos about using your online platform. Be sure to take advantage of the extra resources available to you. An online platform not only gives you 24/7 access to your account or portfolio information – it often allows you to group that information in a way that makes sense to you. Explore the customization features to create a view that feels intuitive to you. Many online platforms provide quick access to additional investing tools from your bank or firm, such as market research, information about stocks and mutual funds, and more. Your online platform may come in handy during tax season, too. Many provide access to electronic versions of tax forms and convenient file downloads. Some platforms even allow you to directly import your financial details into common financial software like TurboTax® or Quicken®. All of these features – and many more – are included in Baird Online, the firm’s online platform for Private Wealth Management clients. Learn more about Baird Online or access Baird Online at bairdonline.com. Using an online financial platform can not only streamline your financial life – it can also enhance your relationship with your financial advisor. 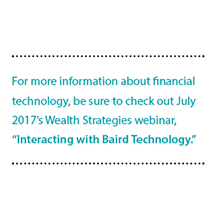 Contact your Baird Financial Advisor to learn how you can use Baird’s technology to collaborate on your unique financial goals.